America has a huge part-time workforce problem. And it's Worry Number One for Federal Reserve Chair Janet Yellen. She has talked about part-timers at each of her last three press conferences, at nearly every speech in the last six months and at both of her past two testimonies to Congress. Yellen's worries stem from the fact that the part-time U.S. workforce is at "very high levels." Excluding the Great Recession, the 6 million Americans who work part-time but want full-time jobs today are at the highest level in about 30 years or so. The number has come down since its peak during the recession but some experts believe America now has a "new normal" -- a permanently high number of part-timers. Experts call these jobs "hidden unemployment" because these people are capable of working more hours than they can get. It's a tough situation. About 25% of part-time workers lives in poverty, according to a study by Rebecca Glauber, a professor at the University of New Hampshire. Only 5% of full-timers live in poverty. Many part-timers are paid less per hour than full-time workers with the same responsibility and job. They're more likely to lose their jobs than full-time workers and they often have no health benefits or paid time off, according to Chris Tilly, a UCLA economics professor. "The practice of offering part-timers a much-reduced benefit package is close to universal." says Tilly. Monica Valerio is a good example. She would do anything for a full-time job. Valerio was laid off from her job at Stanford University's human resources department in 2009 after working there for 20 years. Since then, she's worked a part-time job at a nutritional supplements company in the Bay Area. She has no health benefits or paid time off. 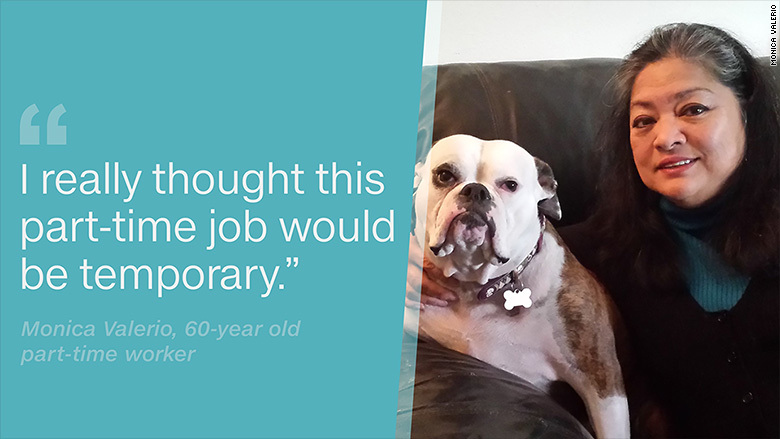 Now, at age 60, she fears she'll never get another full-time job and will have to sell her home to avoid bankruptcy. "I really thought this part-time job would be temporary," says Valerio, who lives in Alameda, Calif. "It's getting harder and harder to make ends meet as the years go on." Valerio says she makes $18,000 a year at her current job. At Stanford, she made $63,000. Despite constantly searching and applying for full-time jobs, she feels employers turn her away because of her age. "People like me are dinosaurs in the job market," she says. The U.S. job market looks very healthy overall: the unemployment rate is 5% and American businesses have been on a hiring spree the past two years. But the sore spot in the economy remains part-time workers. The number of "involuntary" part-time workers reached a high of 9.2 million in September 2010. But in the last three decades the involuntary part-time workforce averaged about 4.8 million -- a lot lower than the levels today. "It's a big part of what's wrong," says Robert Brusca, an economist at FAO Economics, a consulting firm. Part-time workers are central to the debate around the job skills gap in America and paltry wage growth in recent years, which is a major reason why Americans don't feel great about the economy. Beyond job skills, some experts point to the Affordable Care Act -- or Obamacare -- as a reason why part-time work remains high. At the start of 2015, a key provision in the law stated that employers of large businesses had to offer health care coverage for employees who work 30 hours or more per week. 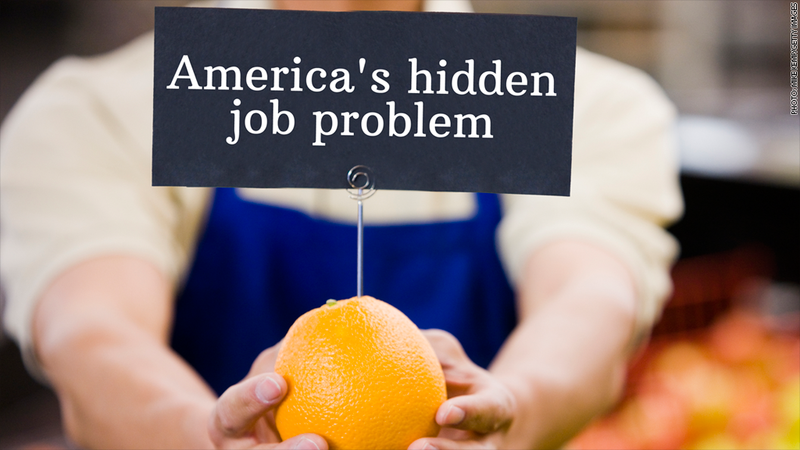 To avoid that law, several companies like Walmart (WMT), Target (TGT), Trader Joe's, Home Depot (HD) lowered the number of hours that employees worked to avoid paying health care. Some ended health care coverage for part-timers in 2013 and 2014. Thousands of workers were impacted. With the rise of the gig economy, where people have part time jobs such as driving for Uber, some experts say the United States will have a permanently higher number of part-timers. However, it's unclear if Uber drivers, who epitomize the gig economy, are working part-time voluntarily or because they can't find other jobs they are qualified for. Valerio too is considering becoming an Uber driver to pick up some extra income while she seeks a full-time job. "I don't see a future in what I'm doing now," she said.